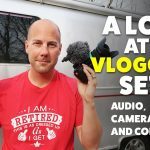 On this Airstream Life vLog, we continue having issues with the 30amp power at the Spokane KOA. After talking to a maintenance guy and realizing we probably would not be able to run our A/C for most of the next couple of days (in 99-degree heat) Courtney jumps on the phone and finds us 50amp service 1.5 hours away in Wilbur WA. Since it is in the direction we were going to go anyway…we head out! Nothing special about the park in Wilbur but we have power and A/C and good WiFi so we’re good for a couple of nights.